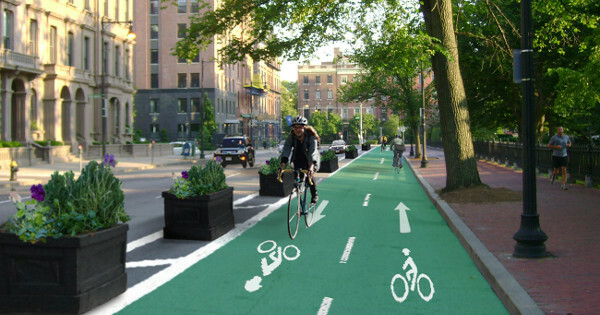 A rendering of a planter-protected bike lane being used by Sustain Charlotte’s campaign. Rendering by Jessi Flynn. A vision of grand transformation isn’t the only way to improve a city. But it certainly can help. Sustain Charlotte, a group pushing for a new east-west protected bike lane through Uptown in North Carolina’s largest city, has no shortage of vision. “When I travel and people find out I’m from Charlotte I want their first response to be, ‘Oh? Do you ride your bike everywhere!? '” bicycle program director Jordan Moore wrote last week in the Charlotte Agenda. These Charlotteans are choosing bikes in their daily lives, not thinking about Moore’s longer-term vision for the city. But improving biking requires real choices and tradeoffs. Without a big goal, people who don’t bike themselves won’t understand that the point of ambitious bike plans isn’t to make cities better for people who currently bike, it’s to use biking to improve the city for everyone. When people bike, good things happen: health premiums drop, more poor children escape poverty, air stays cleaner and there’s room for more people on roads. Charles, Salena, Davin and Jordan are making it more likely for more people to understand that. > Bike lane philosophy: Are you an incrementalist or a completionist?